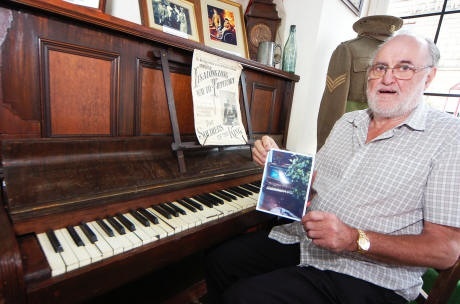 A piano used to compose one of the most famous songs of the First World War has been saved from bushes outside a pub. Marching anthem ‘It’s a Long Way to Tipperary’ helped bolster morale among troops and many believe it was first penned in the Plough Inn – since renamed the Tipperary – between Honiley, Fen End and Balsall Common. So when Peter Viola discovered the pub’s historic piano rotting outside with a fish tank lodged in the middle – he decided it needed rescuing. The next four months were spent painstakingly restoring the instrument which will now be put on display. Peter, manager of Warwick Antiques Centre, said: “It was enormously important to me to preserve this special piano for the nation. Harry Williams, one of the songs composers, lived at the Plough Inn and it was here in 1909 with partner Jack Judge he wrote a song titled ‘It’s A Long Way to Connemara’. It wasn’t until three years later it was renamed ‘Tipperary’. Jack had done it to win a bet and Harry was said to be furious, but the pair went on to make thousands of pounds in royalties. For many years the piano remained at the pub but in 2004 it was put up for auction. Two owners later it was back at the Tipperary where it fell into a terrible state. Restoring it has been a labour of love for Peter. He added: “When I first moved it, it immediately started to fall apart. I put it in the back of my car and left it there overnight. When I checked the next day found it had sweated and the car was covered in water. The rebuilt piano – accompanied by a collection of First World War weapons, armaments and memorabilia – will be on display at the Warwick Antiques Centre on the High Street until the end of September. Following the exhibition Peter is keen to find a good home for the piano. He does not want to sell it but is hoping someone will make a donation to the Royal British Legion. Anyone interested can contact him on: 07770 897707.